NCHM JEE 2015 Counselling: How to participate? 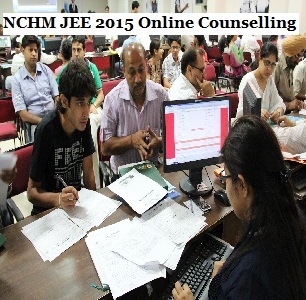 NCHM JEE 2015 Counselling: How to participate? NCHM JEE 2015 Counselling: How to participate? NCHM JEE 2015 Counselling has begun from May 26. National Council for Hotel Management and Catering Technology (NCHMCT) has provided online mode for counselling process. Candidates who have been shortlisted as per NCHM JEE 2015 Result can check the counselling procedure of NCHM JEE 2015 in this page. NCHM JEE 2015 Online Registration and Choice Filling for Counselling Round 1 was available till June 8, 2015.